Macedonian affair with the Sun - republic-of-macedonias jimdo page! 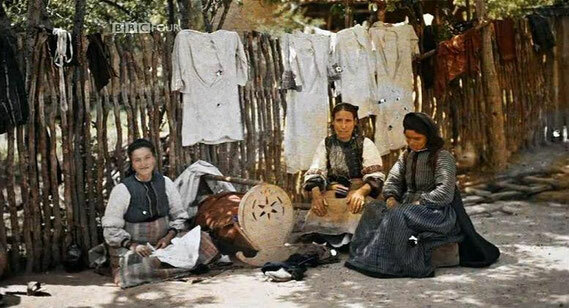 Here is a picture taken by Albert Kahn’s photographers in Macedonia. The picture is from 1912 and is one of the first in the world taken in color. Please notice the Sun symbol on the rocking bed. Macedonia's Megalithic-era Kokino Observatory is located 1,030m above sea level on the Taticev Kamen Summit near Kumanovo. Archaeological and astronomical analyses have shown that the observatory is more than 3,800 years old. According to NASA, which released a list ranking observatories by age, it is the fourth oldest in the world, after Abu Simbel in Egypt, Stonehenge in Britain and Angkor Wat in Cambodia. Kokino has incredible astronomical preciseness and has a central observation post and accessory observation posts. The observatory defines the four main positions of the Moon and three main positions of the Sun during a year, the autumnal and vernal equinox and winter and summer solstice.One specially positioned marker shows that the observatory was also used to follow the movement of the star cluster Pleiades. The observatory was designed by the end of the Bronze Age and suggests a highly developed civilisation. Ancient people made their calendar with precision, with many markers and cuts in the rock and on some places on the observatory. The observatory also helped them to determine the time for harvest and other dates. This is perhaps the biggest problem with Sitchin’s interpretation of VA243 signifying the solar system. Simply put, if the central symbol in his solar system isn’t the sun, the interpretation collapses completely. There’s actually a good deal of evidence to demonstrate decisively that Sitchin is wrong here. Toward offering that evidence, we’ll first introduce a few general comments on Sumero-Akkadian symbols and move to the specifics. Like all ancient religions, Sumero-Mesopotamian religion had a great concern with heavenly bodies that could be observed with the naked eye. In particular, the sun, moon, and Venus were important focus points because of their ease of visibility, and each was artistically symbolized and stood for a deity. The reader should note immediately that this is NOT the symbol on VA243. VA 243’s “pseudo-sun” lacks the wavy lines and is not set inside a circle. 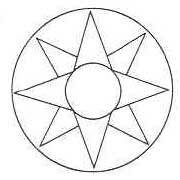 This sun symbol is ubiquitous in Sumero-Mesopotamian religious artwork. The other common symbol for the sun god was the god in flight upon a set of wings (a depiction akin to the winged disc in Egyptian religion). Note that this example has eight points. This is the most frequently attested style in Sumero-Mesopotamian religious art. 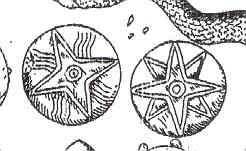 The star also is found with six (like VA 243) or seven points, and the points even vary within the same seal or stela carving. It wasn’t consistent in points, but what the symbol stood for was consistent – either a star, planet, or deity – but NOT the sun. 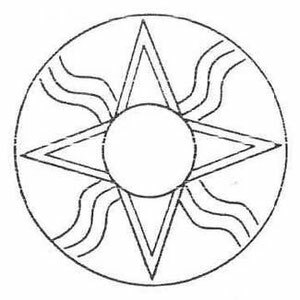 The star symbol is either set within a circle or, far more often, not within a circle. It is clearly distinct from the sun symbol. How do I know that the symbol of VA 243 is a star and not the sun disk? 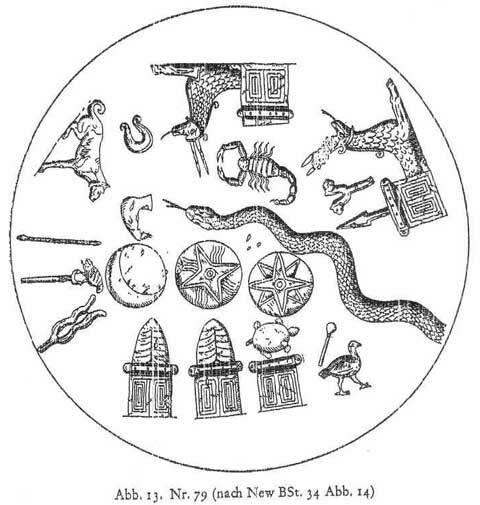 Other than the obvious noted above – that VA 243 does not have the wavy lines between the “arms” of the symbol and is not set within a circle - Sumero-Mesopotamian religion often grouped the symbols for the sun god with that of the moon god (Akkadian = Sin; Sumerian = Nanna) and Ishtar (Sumerian = Inana). This isn’t surprising since they were so readily viewed. In short, they didn’t confuse the symbols and neither should we. Source: Ursula Seidl, Die Babylonischen Kudurru Reliefs, Tafel 11, Zweite Gruppe, stela “a” = The Babylonian Kudurru Reliefs, Plate 11, 2nd Group, stela “a”. Note the wavy lines and encircled sun symbol on the right. Ursula Seidl, Die Babylonischen Kudurru Reliefs, Tafel 19, Vierte Gruppe, stela “b” = The Babylonian Kudurru Reliefs, Plate 19, 4th Group, relief “b”. Note the wavy lines and encircled sun symbol on the lower right. In the above example, note that: (1) the star has seven points, and (b) the stars below it have six points. Note also that these smaller stars also LACK points – they are just dots. This seven dot/circle arrangement is one of the most common motifs in Mesopotamian art, and denote the Pleiades. 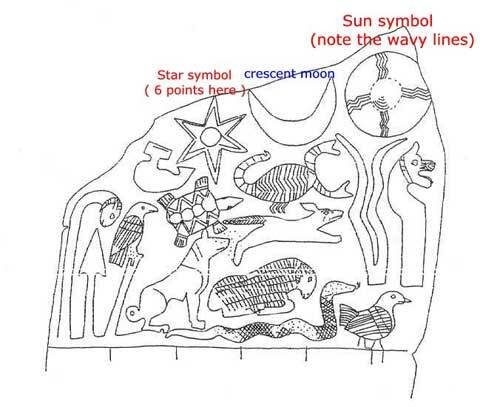 The point here is that dots = stars in Mesopotamian art when in an astronomical context (or a context where a deity is identified with a star). This is important for our consideration of VA 243. Note that the star symbol here has six points as does the VA 243 star. Some commentary on this last example is in order. The previous two examples clearly are in zodiac context, as is this one. 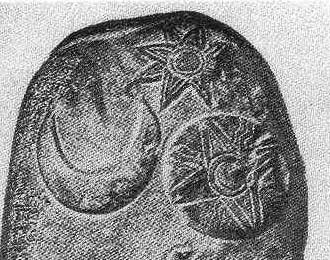 Those previous two examples clearly have the sun symbol drawn in a manner consistent with expected Sumero-Mesopotamian features (wavy lines, encircled) that unmistakably distinguishes the sun from the star symbol. The star symbol signifies the same astronomical body in each case, yet the number of points varies. This means that the number of points is unimportant for identifying the star symbol as a STAR or planet, NOT the sun. Hence one cannot say, “well the star symbol usually has eight points, and the Sitchin seal has six, therefore it’s not a star but the sun.” This is erroneous because these examples demonstrate clearly that a star symbol can have 6, 7, or 8 pts., and LACKS wavy lines. The symbol on Sitchin’s VA 243 is NOT the sun. It is a star, and thus denotes a star, a god, or a single planet. This isn’t my opinion, it’s the Sumero-Mesopotamian art convention.